For other uses of Castanet or Castanets, see Castanet (disambiguation). Castanets, also known as clackers or palillos, are a percussion instrument (idiophone), used in Spanish, Kalo, Moorish, Ottoman, Italian, Sephardic, Swiss, and Portuguese music. In ancient Greece and ancient Rome there was a similar instrument called crotalum. The instrument consists of a pair of concave shells joined on one edge by a string. They are held in the hand and used to produce clicks for rhythmic accents or a ripping or rattling sound consisting of a rapid series of clicks. They are traditionally made of hardwood (chestnut; Spanish: castaño), although fibreglass is becoming increasingly popular. In practice a player usually uses two pairs of castanets. One pair is held in each hand, with the string hooked over the thumb and the castanets resting on the palm with the fingers bent over to support the other side. Each pair will make a sound of a slightly different pitch. The origins of the instrument are not known. The practice of clicking hand-held sticks together to accompany dancing is ancient, and was practiced by both the Greeks and the Egyptians. In more modern times, the bones and spoons used in Minstrel show and jug band music can also be considered forms of the castanet. During the baroque period, castanets were featured prominently in dances. Composers like Jean-Baptiste Lully scored them for the music of dances which included Spaniards (Ballet des Nations), Egyptians (Persée, Phaëton), Ethiopians (Persée, Phaëton), and Korybantes (Atys). In addition, they are often scored for dances involving less pleasant characters such as demons (Alceste) and nightmares (Atys). Their association with African dances is even stated in the ballet Flore (1669) by Lully, "… les Africains inventeurs des danses de Castagnettes entrent d'un air plus gai …"
A rare occasion where the normally accompanying instrument is given concertant solo status is Leonardo Balada's Concertino for Castanets and Orchestra Three Anecdotes (1977). The "Conciertino für Kastagnetten und Orchester" by the German composer Helmut M. Timpelan, in cooperation with the castanet virtuoso, José de Udaeta, is another solo work for the instrument. See also the tocatta festiva for castanets by Allan Stephenson. Sonia Amelio has also performed her castanet arrangements as a concert soloist. 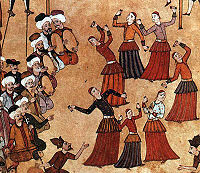 In the late Ottoman Empire, köçeks not only danced but played percussion instruments, especially a type of castanet known as the çarpare, which in later times were replaced by metal cymbals called zills. Castanets are also sometimes referred to as clackers in the United States. Castanets are often played by singers or dancers. Contrary to popular belief, castanets are not commonly used in the flamenco dance, except for two specific forms: zambra and siguiriyas. In fact, Spanish folk dance "Sevillanas" is the style typically performed using castanet. Escuela bolera, a balletic dance form, is also accompanied by castanets. The name (Spanish: castañuelas) is derived from the diminutive form of castaña, the Spanish word for chestnut, which they resemble. In Andalusia they are usually referred to as palillos (little sticks) instead, and this is the name by which they are known in flamenco. Köçek troupe at 1720 celebration fair at Sultan Ahmed's sons' circumcision. Castanets were used to evoke a Spanish atmosphere in Georges Bizet's opera, Carmen. They are also found in the "Dance of the Seven Veils" from Richard Strauss' opera Salome and in Richard Wagner's Tannhäuser. An unusual variation on the standard castanets can be found in Darius Milhaud's Les Choëphores, which calls for castanets made of metal. Other uses include Rimsky-Korsakov's Capriccio espagnol, Ravel's Rapsodie espagnole, Francis Poulenc's Concerto for Two Pianos and Orchestra in D minor and Karl Jenkins's Tangollen. One can also see Spanish influence in the music of Naples through the presence of castanets, as it was registered by Athanasius Kircher on his Tarantella Napoletana (tono hypodorico). When used in an orchestral or jug band setting, castanets are sometimes attached to a handle, or mounted to a base to form a pair of machine castanets. This makes them easier to play, but also alters the sound, particularly for the machine castanets. It is possible to produce a roll on a pair of castanets in any of the three ways in which they are held. When held in the hand, they are bounced against the fingers and palm of the hand; on sticks, bouncing between fingers and the player's thigh is one accepted method. For a machine castanet, a less satisfactory roll is obtained by rapid alternation of the two castanets with the fingers. Handle castanets were developed for use in orchestral music. A pair of castanets are fitted onto the end of a straight piece of wood. They useful for producing a sustained roll, especially loud rolls, on the instrument. Crotalum, was a kind of clapper/castanet used in religious dances by groups in ancient Greece. ^ a b Forsyth 1919, p. 39. ^ Peinkofer & Tannigel 1988, p. 143-144. Forsyth, Cecil (1963) . "Castanets". Orchestration (2nd ed.). Macmillan / Dover. ISBN 0486243834. Peinkofer, Karl; Tannigel, Fritz (1976). Handbook of percussion instruments : their characteristics and playing techniques, with illustrations and musical examples from the literature. Mainz / London: Schott. OCLC 604102910. Wikimedia Commons has media related to Castanets. This page was last edited on 17 April 2019, at 18:06 (UTC).